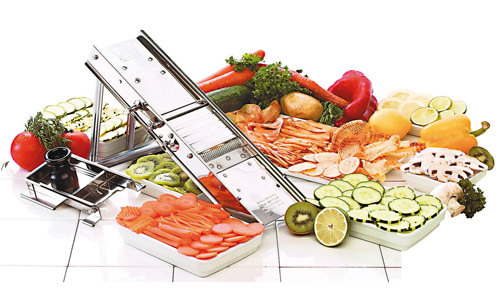 The Bron Mandolin vegetable slicer is made of 100% stainless steel and is used to slice a variety of fruits and vegetables. With its three cutting blades, glide plates and thickness adjustment mechanism, the traditional French mandolin is well equipped to slice, julienne, crinkle and waffle cut. The julienne blade is a reversible 38-prong blade. One side has 10 cutting teeth with spacing while the other side has 28 teeth. All blades are attached to the mandolin, a unique feature to this mandolin, preventing blades from easily getting lost in the cleaning and handling process. Levers allow for gradual thickness adjustments from paper-thin slices up to half-inch slices. The mandolin comes with a hand pusher to anchor and slide vegetables and fruit along the glide plate and protects fingers from the blade. The entire slicer is made of stainless steel, except for the pusher knob which is made of plastic. When folded, its size is Length 12" x 5" x 2".